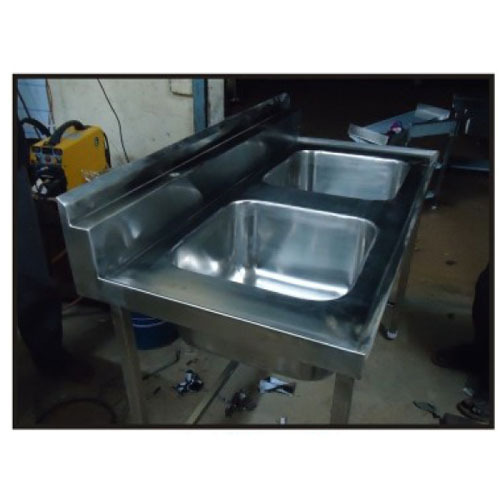 Being the leading names in the industry we are involved in offering a wide range of Two Sink Unit. These are widely used and are well known due to their high durability and reliable nature. These are perfectly designed by our highly skilled professionals using best quality raw material that ensures their anti corrosive nature. Additionally, we offer our products at very economical prices. Sun Kitchen Equipments is a partnership firm, came into being in the year 2012. The company, since establishment, is involved in manufacturing and supplying a comprehensive array of Construction Equipment, Dish Washer Accessory, Steam Cooking Equipment, Commercial Kitchen Equipments, Hot Cooking Equipment, Preparation Equipment, Dining Tables,Hotel Equipments, and many others. Our products are manufactured with utmost precision keeping in mind what clients are demanding for and what make them immensely satisfied. The products offered by us are manufactured using optimum quality raw material, sourced from the industrial renowned and trustworthy vendors. We never compromise over the excellence of products and for which, we have adopted several policies and quality measures that have been recommended by the industry. Advanced production technology and methods are also incorporated by us to develop innovative products and meet the growing demands of our valuable clientele. Owing to the incorporation of advanced methodology, we are also been able to enhance our manufacturing capacity. Apart from this, our products are renowned for optimum quality and have become the prime choice of vast customers as they are repeatedly placing their orders to us.